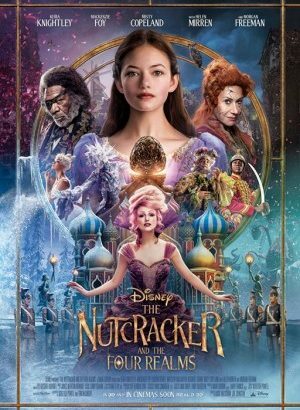 The Nutcracker and the Four Realms is a 2018 American fantasy adventure film directed by Lasse Hallström and Joe Johnston and written by Ashleigh Powell. It is a retelling of E. T. A. Hoffmann’s short story “The Nutcracker and the Mouse King” and Marius Petipa’s The Nutcracker, about a young girl who is gifted a locked egg from her deceased mother and sets out in a magical land to retrieve the key. The film stars Keira Knightley, Mackenzie Foy, Eugenio Derbez, Matthew Macfadyen, Richard E. Grant, Misty Copeland, Helen Mirren, and Morgan Freeman. The film was announced in March 2016 with Hallström directing a script by Powell. Much of the cast signed on that summer, and filming began in October at Pinewood Studios, lasting through January 2017. In December 2017, it was announced Joe Johnston would direct a month of reshoots written by Tom McCarthy, with Hallström agreeing to Johnson receiving co-directing credit.